84 (Coventry Airport) Squadron Air Training Corps: Double Whammy Promotions! 84 (Coventry Airport) is celebrating two rather special promotions this week. 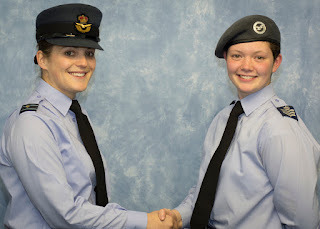 Firstly, Officer-in-Charge, Rosie Robinson was promoted to the rank of Flight Lieutenant (Flt Lt). This means she will also take up the role of Commanding Officer of the Squadron officially although she has been in post since autumn 2015. Since completing the required Seniors Officer Course in April, the promotion has been in the pipeline and finally came through with approval from Headquarters Air Cadets. One of the first parades in her new rank, Flt Lt Robinson called Cadet Sergeant Phoebe Jenner to the front and declared she had been "incorrectly dressed all evening"! She then presented the Flight Sergeant tapes to a very surprised Cadet Jenner. This means that Cadet Jenner will take the role as senior cadet leading the cadet flights through the training programme and developing the Cadet NCO team. Im An Air Cadet Get Me Out Of Here!